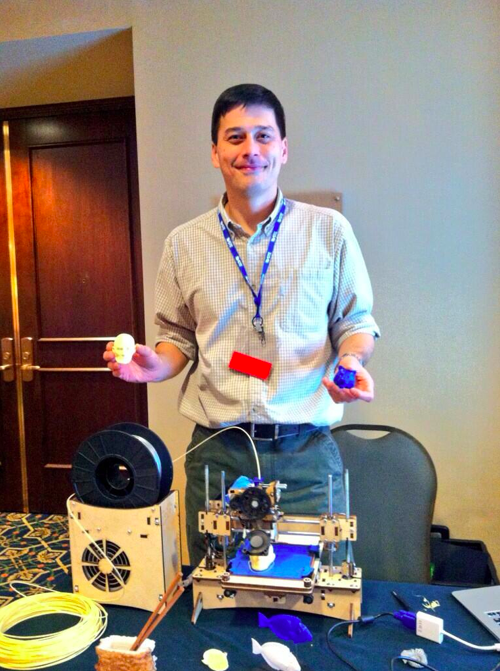 Links and materials for Photogrammetry: Capturing 3D Images – VSTE 2013 session. December 8th, 11-12, Crystal Lobby -Hackerspace. Learn to capture 3D images using 123D Catch on IOS device or on digital cameras and computers. These full color 3D images can be explored in the classroom on an interactive whiteboard. Or download the file for 3D printing or even cutting out of cardboard using 123D Make. Smithsonian X 3D: 3d.si.edu : The Smithsonian has begun publishing high quality 3D scans of items in the museum’s collection. The full color images can be browsed on the Smithsonian X 3D site. Models can be downloaded. Limited selection available at the moment. Replicating Ancient African Hominoid Fossils : makezine.com : This Make magazine article describes the work of www.africanfossils.org to publish 3D models of fossils and artifacts. Models can be downloaded for 3D printing or fabrication using 123D Make. Thingiverse: Scans and Replicas : thingiverse.com : Thingiverse is a great source for creative commons 3D models. The majority of 3D scans are from consumer/DIY type scanners. A number of museum have made scans available. Autodesk 123D Catch | 3d model from photos : 123dapp.com : 123D Catch is a free app available for PC, iPad, iPod and via web browser. Use the app directly or upload photos from a digital camera. Great way to start capturing full color 3D images. Images can be viewed on the site and downloaded. Site includes gallery of scans. Autodesk 123D Make: 123dapp.com : 123D Make is a free app available for PC, Mac, iPad, iPod and via web browser. Create 3D models from flat layers cut from a printed cutting diagram. Layers can be cut on a laser cutter or hand cut. Instructables: EASY Kinect 3D Scanner! : instructables.com : A tutorial by 14 year old on using a Kinect as a 3D scanner. ReconstructMe | Real Time 3D Scanning Software : reconstructme.net : 3D scanning software for ASUS Xtion Family or PrimeSense Carmine Family or Microsoft Kinect Family. PC only. Free version is watermarked. Digitizer | 3D Scanner | 3D Scanning | MakerBot : store.makerbot.com : Consumer/prosumer desktop 3D digitizer. Optimized for creating 3D scans that are compatible for 3D printing.